An important art exhibition opens on April 15 at the Takoma Park campus of Montgomery College, continuing through May 31. The opening reception, to which you are cordially invited, begins at 7 pm on April 17. Please try to attend! Featuring works by: photographer Gary Schoichet; drawings by the child survivors of Hiroshima; ceramic masks by multimedia artist Marion Held; the poetry of John Canaday; and the Program on Science and Global Security at Princeton University. The traveling exhibition from Princeton University, “Shadows and Ashes: The Peril of Nuclear Weapons,” sponsored by Montgomery College’s Institute for Race, Justice, and Civic Engagement, Peace Action Montgomery, and Prevent Nuclear War/Maryland will be on view at Montgomery College’s Cultural Arts Center located at 7995 Georgia Avenue, Silver Spring, Maryland. It will be accompanied by various events, including films, lectures, and discussion. 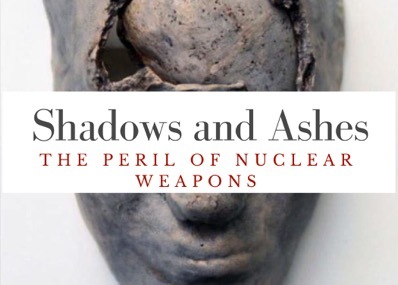 The installation will open on April 15, 2019, with an opening reception on April 17 (7:00-9:00 p.m.) This exhibition of art and science examines the role of nuclear weapons in our society and reflects on their results. By combining artwork and scientific information, it opens conversations on the practical and the philosophical implications of humans’ continued efforts to create and to dismantle nuclear weapons. This multi-faceted exploration of the implications of nuclear weapons includes photographs, drawings, masks, and technical information. Photographer Gary Schoichet provides portraits and reflective comments of Hiroshima survivors, as well as documentary photographs of the historic 1982 Anti-Nuclear Rally in New York City. All Souls Church in Washington, D.C., contributes Hiroshima Children’s Drawings in crayon from 1947 by young survivors. In commemoration of the human catastrophe in Japan, multimedia artist Marion Held has made ceramic masks as a response to her exploration of the site of the bombing at Hiroshima. We will be posting related events as they are finalized throughout the time of the exhibition on our Web site, www.peaceactionmc.org/. Check back often so that you don’t miss anything. For information on exhibit hours and parking, visit mcblogs/montgomerycollege.edu/cac. Previous Where are the children?